Permaculture is not just about gardening, but that IS a natural place to begin to understand permaculture as: a design protocol. It is way of thinking about design problems that guide and orders our decision making. The term Permaculture was ‘coined’ as a collaboration between Bill Mollison and his student, David Holmngren and was first expressed globally through the 1978 book, Permaculture One. Permaculture is an applied systems-based science and art, combining Appropriate Technology, Green Architecture, Natural Building, Renewable Energy, Alternative Waste Management, Organic Agriculture, Edible Forest Gardening, Nature Awareness, and more. The Permaculture Design Course (PDC) we are offering, will provide a holistic, intentional framework for creating community resiliency. In our post-industrial age of Global Climate Change, Peak Oil, Nature Deficit-Disorder, and Financial Collapse, Permaculture has been gaining recognition, as a foundation of sustainable design and a joyous, community building solution to creatively, re-connect as a part of “nature learning, not separated”. Throughout our Great Lake State, in all of our communities, we feel that everyone has a need and wants ecological design information, ideas, skills, and perhaps most important of all, empowering and paradigm-shifting experiences. The demand for Permaculture has rapidly increased during the last few years, yet we have had far too few opportunities to study, practice and implement these ideas. So, let’s do this EPIC work! Consider taking any of the exciting and meaningful, upcoming 72-hour PDC certification courses in Cadillac, Detroit, Lansing, Traverse City and a few other Michigan locations, where together, we will apply classroom experience and hands-on practical activities, and keep working toward the change we wish to be. Who will benefit from a Permaculture Design Course? -Renters & Homeowners: Learn simple steps to improve your home ecosystem while saving money, resources, and building a healthy habitat. -Experienced or Beginning Farmers and Gardeners: Expand your awareness of ‘gardening like a forest’ and the value of perennial vegetable and herb production. -Planners & Managers: Learn how to integrate sustainable design methodologies into the planning process using a multi-disciplinary approach. -Municipal, State & Federal Employees: Improve work efficiency and public service via creative land, water, and air resource management techniques. -Building Design & Construction Professionals: Learn practical natural building systems, and how to integrate land-use design into the built environment. -Landscape Architects & Gardeners: Learn sustainable landscaping techniques focused on functional, edible, and economic plants, the creation of micro-climates for extended growing seasons, and rainwater harvesting. -Non-profit & Community Leaders: Integrate ecological design, professional networking, and social marketing approaches to advance your programs. -Entrepreneurs: Explore how ecological models can be used to design, develop, implement, and manage a sustainable business venture. -Regular Folks like us: Integrate ecological systems design and social/environmental change practices into your powered down life. Now that we have snow on the ground (finally in January! ), I am feeling slightly desperate. Desperate for longer time spent outdoors in the fresh air and sunshine, rather than a quick bike ride downtown. Desperate for super-fresh greens bursting with flavor and life. And this year, as I settle into my shared urban surroundings and friendly, Traverse City neighborhood, I’m also desperate to get back into my organic perennial and vegetable garden. Because there’s nothing like stepping out your back door to grab some fresh herbs to garnish a meal, or some fixings to toss in a quick salad, or eating handful of raspberries. And then, there is the beauty of it all, like witnessing flowering herbs and fruit trees in full bloom! A garden is something that almost anyone can create, and North West Michigan has an ideal temperate climate for growing many kinds of nuts, fruits, berries and vegetables. So if you have a little patch of land (aka yard) and you haven’t already started a garden, here are some good reasons—in no particular order—to grow some of your own food, AND to creatively learn the heart, mind and soulful benefits of growing your own. 1. Spending time in the great outdoors. When’s the last time you went out and played in the dirt, enjoying fresh air and nature? On average, we spend as much as 90 percent of our time inside. Start a garden and get outside. 2. Eating really, really locally. Our food travels an average of 1,400 miles to reach us; on the other hand, you can’t get more local than your own yard! 3. Fresh, flavorful, extra nutritious veggies. A vegetable grown in nutrient-rich soil and picked minutes before eating is much tastier and more nutritious than a vegetable that was picked two weeks ago and shipped across the country. 4. 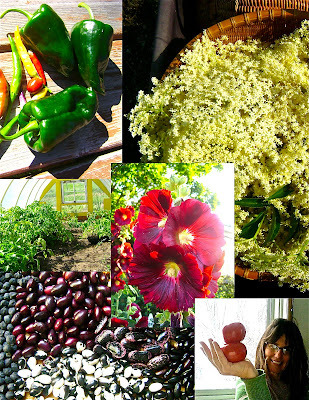 The chance to learn about and eat perennial and annual fruits and vegetable varieties you can’t find in the store. Supermarket produce varieties are limited to those that have a long shelf life, can withstand shipping, and are uniform in appearance. That means you are missing out on a wide variety of delicious if not so sturdy fruits and vegetables. 5. Eliminating pollution. The chemicals and non-sustainable farming practices used to grow non-organic crops are contributing greatly to the dead zone in the Gulf of Mexico, which is now estimated to be around 7,900 square miles. Shipping food grown in far-off places, whether it’s organic of not, also contributes to global warming and pollution. 6. Getting more exercise. Feel like you could use a little exercise following a cold winter spent indoors? According to caloriecounter.com, hauling a wheelbarrow can burn 340 calories per hour, raking, 292 calories, weeding, 306 calories, and general gardening, 272 calories. It costs less than the gym! 7. Eating sustainably. Gardening organically means nourishing the soil that grows the food that nourishes you and creating a backyard eco-system that attracts and supports beneficial wildlife in a balanced way. 8. Getting to know your neighbors. When your fertile soil leads to an abundant harvest, you may find yourself wandering the streets looking for people to give your excess vegetables to. You may end up being the most popular person in the neighborhood! 9. Getting your kids to love vegetables. Kids who grow vegetables are more likely to eat vegetables. This is also a good way to foster a child’s connection with the natural world and sense of environmental responsibility, and to help them to establish a lifestyle that includes good eating habits and outdoor activity. 10. Saving money. With an initial investment of tree saplings, some seeds and seedlings, and a little time, you can grow a whole season’s worth of produce that’s free for the picking. For the cost of one bunch of chard, you can buy enough seeds to grow sufficient chard to last you into the fall. 11. This is not the 18th century. Lawns were popularized in the 18th century, in great part by Lancelot “Capability” Brown’s contributions to landscape architecture. Mr. Brown’s “garden designs” or lawns quickly became a status symbol by the wealthy. Fortunately, today we can sensibly realize that not only for the TRUE wealth and health of our human families, but also the rest of Earth’s species, we need to participate in a living, whole-system and let go of the powering over mentality that a well trimmed lawn dictates, with cancer-causing chemical pesticides, fertilizers. Of course, not everyone knows “how-to” garden or might not have realized that until this very moment, that you may yearn to take up gardening. We’ve been raised with lawn mowers as the American way of life. If you are in need of garden growing advice and mentoring, or feel you can’t grow your own vegetables due to lack of space, time, or inclination……or if you are honestly afraid to give up your lawn, O’k CSA is here to support you. We offer garden design and yard transformation services and will provide the help you need ….”to grow more fruits, nuts, berries, herbs and vegetables, than you ever thought possible on less land than you could imagine”…and to have a truly beautiful, “yarden”. O’k CSA offers practical and common-sense ways of mending, tending and care-taking your personal home-grown, food system: Garden Design & Yard Transformation, Permaculture Design Service & Consultation, with friendly advice from Penny Krebiehl, a certified permaculture designer, student and teacher. 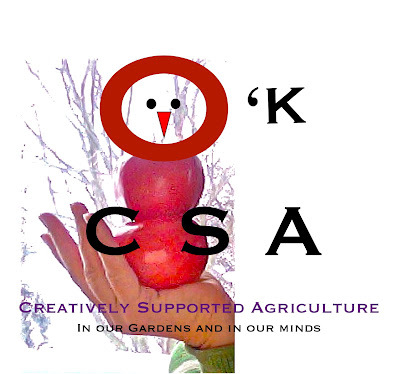 Look for O’k CSA at the Northern Michigan Small Farms Conference on January 28th, in the lovely frozen north-lands of Grayling, Michigan. Now that winter has actually arrived, I’ve settled into my daily reading tasks. I have an interesting mix of books laying near chairs, on my table and near my bed. None are neglected, all read in bits, or chunks, depending on what food my brain needs and how much reading time I can afford myself with “other” work needing tended to. A book that seems to be speaking LOUDLY before I’ve done much more than read the introduction….is by Donella Meadows, called “Thinking in Systems”. From the introduction, I can see that my transforming-rewiring-woman self, who since little girlhood has agreed with Dorothy Day’s statement: “Most of our problems stem from our acceptance of this filthy rotten system” is on the way to being nourished.